The Ramblers Association are marching on Shropshire Council's offices today in protest at cuts of up to 40% to the budget for footpaths and rights of way. Stirchley & Brookside Parish Council was one of the founding members of South Telford Rights of Way Partnership (STROWP) which is an excellent model for the Ramblers Association to adopt for Shropshire. I spoke to our parish clerk this morning for some history on STROWP as I was aware of the work it currently does but not of how it came into being. I was surprised to learn that it was set up some 20 years ago to fight against foothpath closures by Telford Development Corporation (TDC) who were building on vast swathes of green space that is now south Telford. The group has evolved over the years into its current form where it is more concerned with promoting the walks around south Telford and ensuring footpaths are properly maintained. 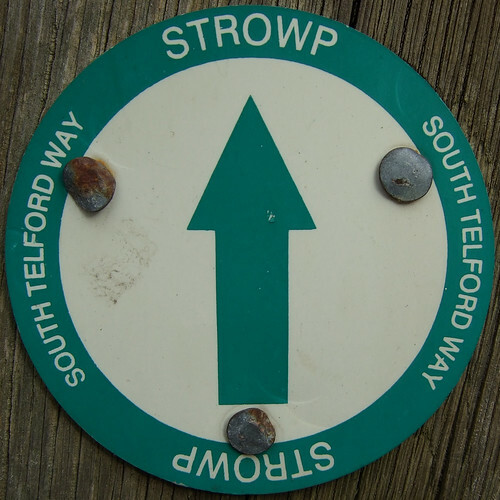 STROWP produces leaflets for self-guided walks around south Telford as well as at least one guided walk for fundraising. The parish councils involved - Stirchley & Brookside, Madeley, Dawley Hamlets and The Gorge - fund a part time project officer for STROWP who organises these events, surveys rights of way and co-ordinates maintenance and repair jobs by Community Payback and volunteers. The partnership works really well for the parishes involved, promoting the walks in south Telford, keeping the footpaths well maintained and informing people about areas of local historic interest. It costs about £1 per household per year to fund the Stirchley & Brookside's contribution to STROWP which really isn't very much money for such a valuable service. The idea could easily be transferred to Shropshire - the parish councils that have a lot of footpaths which are likely to suffer most from budget cuts could collaborate with each other to form a similar group and co-ordinate volunteers. I was interviewed by BBC Radio Shropshire this morning about this very subject which was apparently airing this afternoon. If I can find a listen again link I'll post it here!